The graphic above is a translation (in consultation with Miles Kimball) of the corresponding German language graphic in Alexander Trentin’s original article, in Finanz und Wirtschaft: “Negativzinsen und der Abgesang auf das Bargeld.” Used by permission. When interest rates in general are negative, paper money becomes a high-rate safe asset. This hinders Swiss monetary policy. An exchange rate between cash and money in bank accounts can help. In the strange new world of negative interest rates, Swiss savers have to wonder if they are ultimately going to face negative interest rates on their personal bank accounts, even though so far, Swiss banks are cross-subsidizing regular bank accounts with revenue from high mortgage rates. As soon as someone sees his or her account balance fall because of a negative interest rate applied to a regular bank account, paper currency will begin to look very interesting as an investment. Among safe, liquid assets, franc notes earning an interest rate of zero would be the high-yield alternative. If investors flee from bank accounts into paper money, the monetary policy objectives of the Swiss National Bank will be defeated. The SNB wants negative interest rates to make francs unattractive and therefore to weaken the Swiss franc against the euro. But if negative interest rates for individual investors are pushed down far enough, storing massive amounts of paper currency to circumvent negative interest rates could be made into a profitable business. Nobel laureate economist Paul Krugman argues that negative interest rates can’t go any deeper than is allowed by the “the storage cost of cash.” According to Paul Krugman, there is an effective lower bound on interest rates slightly below zero. University of Michigan Professor Miles Kimball sees no effective lower bound on interest rates. His idea is to extend negative interest rates to cash. He has argued for some time now for resolute action through deep negative interest rates to fight recessions (which might also involve some exchange rate depreciation). According to Kimball, the best way to implement a negative interest rate on cash is through a gradually increasing paper currency deposit fee at the cash window of the central bank, where private banks come to turn their cash into funds in the accounts that they hold at the central bank (called “reserve accounts” at the Fed and “sight accounts” at the Swiss National Bank). The private bank would owe a fee when it deposited its cash into its account at the central bank. The fee would need to gradually increase in order to generate a negative interest rate on paper currency. For example, to generate a -2% interest rate on paper currency, the paper currency deposit fee would need to rise at a rate of 2% per year. This fee would reduce the value of cash relative to the value of money in the bank (“electronic money”). In the accompanying interview, Kimball compares the implications of this fee to an exchange rate. The graphic at the top shows more details of how Kimball’s proposal would work. Last year Miles Kimball visited the Swiss National Bank to present a seminar about his idea. Kimball is now “hopeful” that in Switzerland or Sweden, the deposit fee will be implemented quickly. He emphasizes that it would be possible to introduce such a deposit fee "tomorrow”–and thereby gain leeway to lower key interest rates further. For the Swiss National Bank, SNB such an interest rate adjustment would be an effective way to finally weaken the franc. Because cash is an obstacle to monetary policy, many economists would see it as progress to make electronic money the unit of account and the sole legal tender. The transition from a paper money standard to an electronic money standard would be similar to the transition from the gold standard to a paper standard. 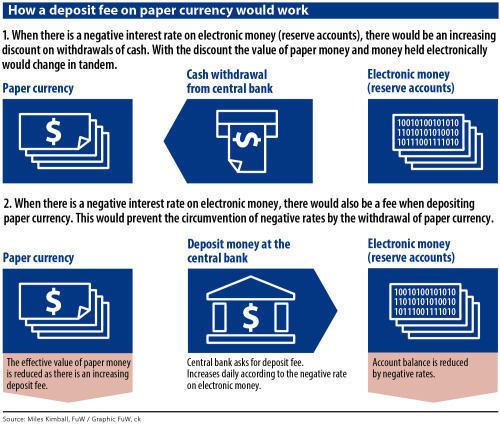 With electronic money as the unit of account and cash taken off of its pedestal, the implementation of negative interest rates would no longer be a problem–numbers in the computer can be revised downward as needed, and cash can be handled by changing its value relative to electronic money as discussed above. But cash need not be abolished–and maybe shouldn’t be. Some people like cash. And William Buiter, chief economist of Citigroup points to the value of cash in protecting privacy. And those who don’t have bank accounts would be disadvantaged by the total abolition of cash. on whether central banks are forced to reduce interest rates further below zero. It is possible that the Swiss National Bank might aim for a further cut in interest rates rein in the overly strong franc. lead to further interest rate cuts. Siegenthaler writes: “More negative interest rates would probably draw broader government involvement, since it would require a change in the law to allow the taxation of cash.” Without alternatives, this possibility can’t be ruled out of hand. For many Swiss, the idea that fees could ever be charged on cash in liberal Switzerland would have been unthinkable only a few years ago. But that is where the logic of current monetary policy ultimately points. In a time of negative interest rates, paper money with a safe return of zero is like a relic from another time.